Review by AllTheBestFights.com: 2018-10-13, good start between Shakur Stevenson and Viorel Simion: it gets three stars. The undefeated Olympian Shakur Stevenson entered this fight with a perfect record of 8-0-0 (4 knockouts) and he is ranked as the No.78 featherweight in the world. He has already fought four times in 2018 winning over Juan Tapia, Roxberg Patrick Riley, Aelio Mesquita and Carlos Ruiz. His opponent, Viorel Simion (former Olympian as well), has a boxing record of 21-2-0 (9 knockouts) but he is not ranked as he hasn’t fought since April 29, 2017 when he was defeated by Scott Quigg (Scott Quigg vs Viorel Simion); before this bout, in 2016, he had beat Alexander Miskirtchian and Andoni Gago. 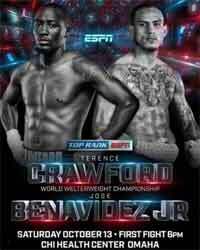 Stevenson vs Simion is valid for the vacant WBC Continental Americas featherweight title; undercard of Terence Crawford vs Jose Benavide Jrz. Watch the video and rate this fight!